Nearly 100 proteins are proposed to be substrates for GSK3, suggesting that this enzyme is a fundamental regulator of almost every process in the cell, in every tissue in the body. However, it is not certain how many of these proposed substrates are regulated by GSK3 in vivo. Clearly, the identification of the physiological functions of GSK3 will be greatly aided by the identification of its bona fide substrates, and the development of GSK3 as a therapeutic target will be highly influenced by this range of actions, hence the need to accurately establish true GSK3 substrates in cells. In this paper the evidence that proposed GSK3 substrates are likely to be physiological targets is assessed, highlighting the key cellular processes that could be modulated by GSK3 activity and inhibition. Signaling by the Wnt family of secreted glycolipoproteins via the transcriptional coactivator beta-catenin controls embryonic development and adult homeostasis. 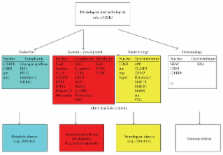 Here we review recent progress in this so-called canonical Wnt signaling pathway. We discuss Wnt ligands, agonists, and antagonists, and their interactions with Wnt receptors. We also dissect critical events that regulate beta-catenin stability, from Wnt receptors to the cytoplasmic beta-catenin destruction complex, and nuclear machinery that mediates beta-catenin-dependent transcription. Finally, we highlight some key aspects of Wnt/beta-catenin signaling in human diseases including congenital malformations, cancer, and osteoporosis, and discuss potential therapeutic implications. Copyright statement: Copyright © 2011 Calum Sutherland. Interrelations between substrate cycles and de novo synthesis of pyrimidine deoxyribonucleoside triphosphates in 3T6 cells. GD3 expression in CHO-K1 cells increases growth rate, induces morphological changes, and affects cell-substrate interactions.